Economists and futurists no longer ask what the future of work will look like, but rather when it will come and how disruptive it will be. Automation, artificial intelligence and other technological advancements are in the workplace today. Some say that innovations should be embraced and, like technological advancements in the past, the average American, and the economy as a whole, will be better off. Others issue dire warnings that automation and robotics will render many occupations obsolete and displace millions of American workers. So which is it? The rose or the thorns? The answer is, it’s complicated. According to the World Economic Forum, automation is expected to displace 75 million workers around the world by 2022. That’s a staggering sum — and in just four years. But the same report predicts that 133 million jobs will be created during the same period. 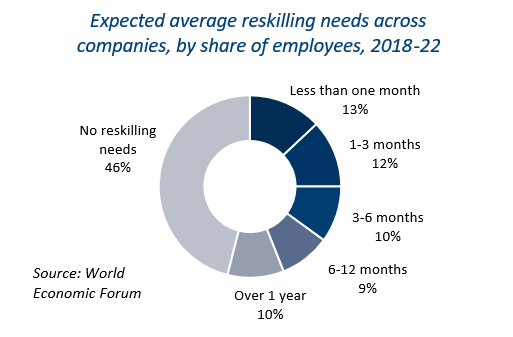 What is almost certain is that, in the next few years, the world economy — and by extension, the American workforce — will experience a significant transformation as businesses adopt new technologies and American workers adapt and reskill to fill new jobs. A new study out of the Boston University School of Law illuminates potential impacts of automation by examining survey data for non-financial private firms in the Netherlands. The researchers obtained data on automation expenditures for more than 36,000 firms over a 16 year period, from 2000 to 2016, in order to measure the effects of automation on employment and wages. The researchers estimate that wages decreased for incumbent workers by about 8.2 percent over five years as a result of automation. However, recent hires experienced no wage loss and even earned 4.4 percent higher income over five years. It follows that the impact of automation will be more severe for older, more experienced workers, who at best will experience shifts in their day to day tasks and at worst will need to pursue further education, training and credentials to adapt. For policymakers and economists, this begs the question: can anything be done to prepare for automation and new technology in the workplace? Mitigate harsh local impacts by expanding support to vulnerable regions and communities that may be hardest hit. Automation and artificial intelligence in the workplace will augment human skill and improve productivity. New technologies like autonomous vehicles and voice recognition will make it easier for all individuals — particularly individuals with disabilities — to access work and participate in civil society. But the future of work will likely bring with it disruption and displacement, and this burden will be disproportionately borne by workers in particular industries, occupations and geographic regions. Federal, state and local policymakers should consider clear strategies to prepare for the future of work. The time to act is now. There’s a racial gap in CTE enrollment. The National Center for Education Statistics reports that, according to high school transcript data, white students earned more (3.2) CTE credits on average than black (2.9), Hispanic (2.6), Asian (2.2) and mixed race (2.9) students. The American Association of Community Colleges developed an infographic based on a recent Pew Research Center study that depicts the different post-high school plans of today’s teens. 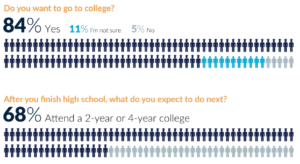 One notable takeaway: 12 percent of teens plan to attend a two-year college and 4 percent plan to attend a technical or vocational school after high school. Skills training is pretty popular with American voters. According to polling from ALG Research, with support from the National Skills Coalition, 93 percent of likely 2020 voters support increasing investments in skills and technical training. It’s not just you — CTE is getting more popular. The American Enterprise Institute looked at media mentions of CTE between 2012 and 2018 and found that the number of articles mentioning CTE has increased by more than a hundredfold in that time. It’s a question that has puzzled education researchers for decades: what is the right mix of experiences in early adolescence that is most predictive of future career success and lifelong learning? For the longest time, the rule of thumb has been “get a bachelor’s degree and you’ll get a good job.” But we know that there are other experiences on the path to a four-year degree (such as participating in work-based learning or earning an industry-recognized credential) that are just as powerful in preparing learners for their future careers. What are these experiences? And how should they be delivered to maximize learner outcomes? Specifically, the researchers find that participating in “relationship-focused CTE” (a term they use to refer to work-based learning and other activities where students interact with industry mentors) is significantly related to higher job quality scores at age 29. This would seem to suggest that building relationships with industry mentors and completing work-based learning at an early age can help learners, particularly low-income learners, get a leg up on their careers. While the data do not provide a full picture of the quality of work-based learning in the study, the evidence is promising. For the purpose of the study, the researchers define “disadvantaged adolescents” as those who, when they were between the ages of 12 and 18, had a family income equal to or less than 200 percent of the federal poverty line; did not have a parent with more than a high school education; had a mother who was a teenager when her first child was born; or whose family received public assistance. They defined job quality based on four factors: earnings, benefits, hours of work and job satisfaction. In a new research brief, MDRC summarizes findings from studies of three different career-focused learning programs: New York City’s Young Adult Internship Program (YAIP), YouthBuild and Year Up. Using a random assignment research design, the researchers find significant positive wage increases for completers of each program. JFF explores how the scope and length of Registered Apprenticeships can vary and poses the question: Are apprenticeships the next stackable credential? The NewDeal Forum Working Group, a national network of state and local leaders, published recommendations for policymakers to help the economy adapt to the future of work. The report includes recommendations for skill development and workforce training; modernizing the social safety net; and supporting entrepreneurship, innovation and access. Mathematica Policy Research shares an update on new partnerships and research focused on pathways to postsecondary education, including an examination of free tuition programs for adult learners, a study of the Better Careers initiative in California, and research into community college career planning through the Working Student Success Network. Keep an eye out for future research. A new study from JFF looks at Maine’s proficiency-based education system and finds some promising early results. According to the study, high school students who received a medium amount of exposure to proficiency-based education had significantly higher reported engagement; however, exposure to proficiency-based education was negatively correlated with SAT scores. $224 million a year. That’s how much more money the most recent cohort of graduates from Tennessee public colleges and universities can expect to make every year compared to non-credential holders. That figure comes from a new report published by the Tennessee Department of Economic and Community Development in June. The report attributes much of the wage gains to the impact of community and technical colleges across Tennessee. While a postsecondary credential pays a premium for graduates, many learners work through college. In fact, according to a new brief from the National Center for Education Statistics, 32 percent of students at public 2-year colleges worked full-time while enrolled in the 2011-12 school year. The study also finds that students were more likely to complete a degree if they worked 20 hours or less a week compared to students who worked full time or did not work at all. The study did not say whether or not these students were working in fields related to their program of study, however. Learners can start working on their postsecondary credential even before they graduate high school. New research from the University of Texas system shows just how much of an impact dual enrollment has for Texas students. According to the study, dual credit students had higher college graduation rates and higher GPAs than their peers. And students who entered the University of Texas system with credits from both Advanced Placement and dual credit classes were five times as likely as their peers to graduate in four years. Yet learners often do not complete their credential at their initial institution. According to the National Student Clearinghouse Research Center, 38 percent – or 1,069,243 students – in the fall 2011 cohort transferred within six years. The study also revealed this startling statistic: only 5.6 percent of transfers from two-year colleges leave with a certificate or associate degree. Postsecondary credentials reinforce the technical and academic skills learners will exercise in their future careers. But employers often look for candidates with a more rounded skill set that can only be learned through experience. A new survey from Bloomberg Next finds that 43 percent of employers say new recruits lack the soft skills to be effective, skills like teamwork, critical thinking and adaptability. One way to build these skills is through work-based learning experiences like internships and apprenticeships. Adults in the U.S. are increasingly recognizing the value of apprenticeships. The American Staffing Association reports that 94 percent of Americans say that apprenticeships are helpful in leading to a new career and 62 percent even think apprenticeships make people more employable than going to college. At any rate, learners have multiple pathways to lifelong career success – be it through an apprenticeship, a two-year college or a four-year university – and should be empowered to choose the path that is right for them. Earning a credential of value is still the surest path to success for American workers. A recent New America poll released last month finds that 80 percent of American adults believe there are more opportunities for those who pursue education after high school, compared to 14 percent who think it is better to enter the workforce right away. For adult learners, the connection between education and careers is even more important. According to Public Agenda, 71 percent of adult prospective students — those who are actively working to go back to school — say that their primary motivation is either to get ahead in their current career or to get the skills they need to start a new career. Studying the return on investment for credential earners can be quite an undertaking, however, considering the vast number and types of credentials on the market today. Credential Engine, a nonprofit dedicated to counting and cataloging every credential, estimated in April that there are more than 330,000 individual credentials available in the United States today, and only a fraction of them are available at four-year institutions. That count includes nearly 67,000 postsecondary certificates, 13,600 Registered Apprenticeships and 5,400 certifications. It is well understood that a university education can improve career opportunities. But where to start? Does major matter? And what is the return on investment for other sub-baccalaureate credentials like associate degrees, postsecondary certificates and industry certifications? With so many credentials on the market, how can learners navigate the education marketplace and find the credential that best suits their career interests and economic goals? New research out of the Georgetown Center for Education and the Workforce helps us begin to demystify the credential marketplace. The report finds that, while median income rises with more advanced credentials, the field of study matters a lot. A bachelor’s degree in architecture and engineering, for example, will land you a median salary of $85,000, far above the $46,000 median salary for education majors. Further, less education can even lead to higher earnings, depending on the field of study. Associate degree holders who study science, technology, mathematics and engineering (STEM) earn a median salary $13,000 higher than workers with bachelor’s degrees in psychology & social work. Certainly, credentials help learners unlock career success and earn a family sustaining wage, but field of study is far more important than level of education. 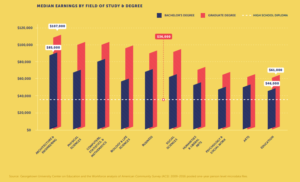 A separate Georgetown study puts a magnifying glass up to one particular type of credential, postsecondary certifications, examining earnings for individuals who earned a certification at an Oregon community college. The study finds that, on average, certification earners experienced a 19 percent increase in earnings. And Pell students experience an even larger premium, more than 50 percent of their wages prior to enrollment, further demonstrating the power of short-term certifications to provide an on-ramp to a sustainable career. How Can States Help Learners Navigate the Credential Environment? As the universe of postsecondary credentials continues to grow, learners will need support and guidance to help determine which credentials to pursue and where to pursue them. Already, a number of states have developed protocols to review, verify and publish a list of high-quality, industry-recognized credentials for secondary and postsecondary students. A new 50-state scan from the Workforce Data Quality Campaign finds that 30 states identify or plan to identify credentials of value at the state level. However, only 23 states report that they analyze employment and earnings outcomes and only 21 seek regular employer input. If credentials are going to deliver on their promise, the credentialing system must be transparent and learners must be able to know which credentials are valued in the marketplace and recognized by employers. It is important for states to set up systems to regularly gather and put to use employer input. The evidence is encouraging, but there is still a lot of work to do to help demystify the credentialing marketplace and empower learners to achieve their career goals. To learn more about credentials of value or state strategies to promote high-quality credentials, visit the Learning that Works Resource Center. Numerous states have begun to allow community colleges to grant four-year degrees. These changes have led to concerns over “credential creep,” where institution leaders push for the increased perception of prestige that advanced postsecondary degree offerings provide them, and neglect their CTE programs. This article from Inside Higher Ed highlights the work being done at Utah Valley University to maintain focus on providing high-quality degree programs, whether they be two- or four-year degrees. The American Youth Policy Forum (AYPF) recently published a new white paper highlighting the shared goals and opportunities for collaboration between afterschool programs and workforce development initiatives. While both youth and workforce development initiatives implement programs and activities to help youth develop skills and competencies for the world of work, they often operate in separate and disconnected silos. For example, afterschool programs have long focused on building the social and emotional skills of students, skills which also contribute to employability readiness. “Participation in high-quality afterschool programs has a positive impact on problem-solving, conflict resolution, self-control, leadership, and responsible decision-making, all of which are included within the employability and [social emotional learning] frameworks.” If efforts are better aligned and resources more coordinated, more of this training can be implemented. The white paper examines case studies in Florida, Pennsylvania and Illinois and from those extrapolates recommendations for further collaboration between the two types of initiatives. This report from AEI examines common barriers for providing high-quality CTE at community colleges and suggest five strategies for overcoming those barriers, most of which are structural and policy barriers, but also include the perceived stigma of CTE. 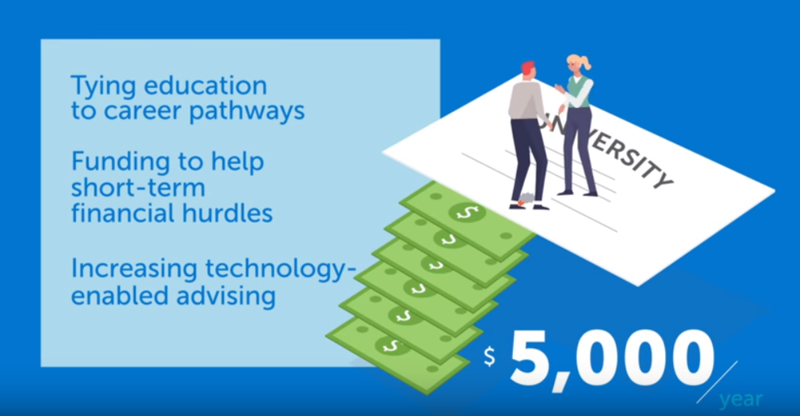 The Georgetown Center on Education and the Workforce (CEW) recently launched this video highlighting the problem of “The Forgotten 500,000” – the 500,000 students who are in the top half of their high school classes but do not go on to complete a postsecondary certificate or credential. Among other recommendations, CEW believes this problem can be solved by tying education more deliberately to career pathways. The American Institutes for Research released this infographic highlighting the importance of using CTE as a strategy for students with disabilities. Students with disabilities who are CTE concentrators are five percent more likely to graduate high school on time and 20 percent more likely to be employed after graduation. Last week, a new research study made its way through the edu-sphere, exciting a lot of CTE advocates. The AERA study – Linking the Timing of Career and Technical Education Coursetaking with High School Dropout and College-Going Behavior – validated some long-held truths about CTE, most notably that it boosts high school graduation rate. In brief, the study found that taking a greater number of CTE courses was associated with a lower chance of dropping out, estimated at a decreased probability of dropout of 1.2% per CTE course completed across high school. The probability of not dropping out – or probability of graduating – increases to 1.6% for every CTE course taken during 11th grade or 12th grade. This jives well with existing data showing higher graduation rates for CTE concentrators – and survey data that shows CTE students are simply more satisfied with their educational experience than students not involved in CTE. However, some of the coverage of this new study left me scratching my head. For example, Education Week’s blog was titled “Career and Tech Ed. Courses Don’t Boost Chances of College-Going, Study Finds” focusing on the research finding that CTE completion is generally not linked to college going, except for a small positive (but statistically significant) link between 11th grade CTE coursetaking and both probability of enrollment within two years (0.8%) and probability of ever enrolling in postsecondary education (0.8%). Now, for a CTE advocate, this is actually a game changer! So, to summarize the chart above, the direct postsecondary enrollment rate for CTE concentrators increased by 28 percentage points between 1992 and 2004, while the postsecondary enrollment rates stayed stagnant for non-CTE students, which is a pretty huge jump. Now, we have new data showing that students engaging in CTE are just as likely to go on to college as those not taking CTE coursework! (As an FYI, the data shared above is from the same dataset used by AERA, NCES’ Education Longitudinal Study). For years, CTE leaders have been talking the talk on the value of CTE, and developing policies, programs and frameworks to ensure our programs also walk the walk. The bottom line is that the quality of CTE programs and policies are on the rise and the data is showing a very positive upwards trajectory. Some of the light criticism following this report is that we “still have work to do” to ensure CTE is a successful college preparation program. But, honestly, CTE hasn’t been designed with college preparation as its core purpose. Rather, it’s designed to support career readiness, with college readiness as a byproduct – and is now doing a pretty impressive job of offering equally rigorous pathways to high school students. Look, I’m not sugarcoating the fact that we still have a long way to go to ensuring every CTE program is of the highest quality and provides meaningful post-high school pathways for every learner. And, I join the researchers in calling for more research on the impact of CTE, particularly around how CTE coursetaking impacts the drop out and completion rate for 9th grade students, who are often a higher drop out risk, something that has not received adequate focus. We also know college enrollment is not a particularly strong indicator of success, when compared to college retention and completion. But this study validates the impressive and difficult work undertaken by states and local leaders to up the rigor and quality of CTE programs and should be celebrated as such. The National Center for Education Statistics recently released a new report summarizing the results from the 2016 Adult Training and Education Survey, which gathered nationally representative data on U.S. adults’ training and education. 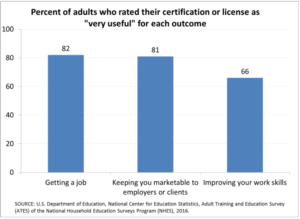 Overall, 27 percent of adults aged 16-65 have a nondegree credential, with 21 percent having an occupational certification or license and 8 percent having a postsecondary certificate. Among those who have an occupational certification or license, 67 percent prepared for their most important certification or license by taking classes from a college, technical school or trade school. Additionally, 21 percent of adults have completed an apprenticeship or internship, with 14 percent doing so as part of an educational program after high school. According to the NCES’ blog post on the survey, “the data show that nondegree credentialing and work experience programs are particularly common in the healthcare field. In fact, health care was the most common field in which both certifications and licenses were held and the most common field for which adults had completed a work experience program. A recent article highlights the successes of the University Innovation Alliance (UIA), a group of 11 research universities who banded together to implement strategies that would help more low-income students complete postsecondary programs. Over the past three years, the universities have increased the number of low-income graduates at their institutions by 24.7 percent, and they are on track to surpass their initial goal of increasing the number of low-income graduates by 34,000 students. Among other strategies, the universities encouraged students to take a minimum of 15 credits per semester to increase their likelihood of completion and shared data analyses and studies with each other to help problem-solve. Their approach has had noticeable effects, even over a short time period. A comparative study recently revealed that 31 percent of the UIA undergraduate students receive Pell Grants compared to 15 percent of undergraduates at Ivy League institutions and at 50 other selective liberal arts colleges. This information is significant in that these 11 research universities are serving vastly more low-income students than many universities, and they are actively committed to helping those students succeed. The Bureau of Labor Statistics recently released a report showing the current and projected entry-level degree requirements for various employment sectors. Interestingly, 6.5 percent of entry-level employment in 2016 was in occupations that typically require postsecondary education for entry. From May 2007 to May 2016, the share of U.S. employment in occupations typically requiring a high school diploma or equivalent for entry fell by nearly 2.6 percentage points, from over 38.3 percent to slightly less than 35.8 percent. Over the same period, the share of employment in occupations typically requiring postsecondary education for entry rose by 2.3 percentage points, from 34.2 to 36.5 percent. Gallup and the Strada Education Network released a report diving into how individuals choose their field of study, based on a survey of 22,000 adults. Respondents were asked from where they received advice about their major, with responses falling into four main groups: formal, informal social network, informal school-based and informal work-based. Somewhat surprisingly, the survey found that the majority of adults used their informal social networks for advice, rather than the more formal (and likely more helpful and informed) channels available to them. More great news has emerged for the Tennessee Promise program, as results on student outcomes continue to come in. Fifty-six percent of Tennessee Promise students who entered college in 2015, the program’s first year, had graduated, transferred to a four-year university or remained in school two years later. Only 39 percent of recent high school graduates outside of Tennessee Promise had done the same — a difference of 17 percentage points. While officials agree there is still more work to do, they are encouraged by these results. A new report commissioned by The Commission on the Future of Undergraduate Education at the American Academy of Arts and Sciences examines the landscape of non-degree postsecondary training. The report focused on five categories: certificate programs, work-based training, skills-based short programs, massive open online courses and other online microcredentials, and competency-based education programs, and provides in-depth analyses of each. 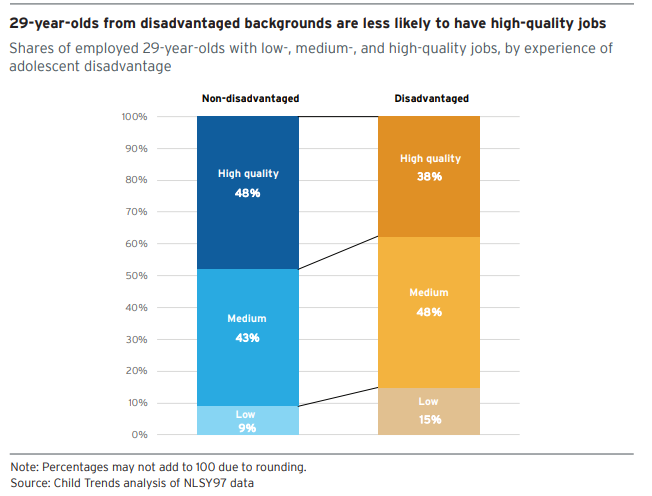 While these types of trainings vary widely across sectors and states, the authors found that they all tended to be shorter, more flexible, and more directly aligned with employer-defined skills than traditional postsecondary degree programs. However, data on learner enrollment and outcomes for these programs is limited, so it is difficult to tell how effective an option they ultimately are for learners. With that in mind, the report also found that more traditional degree programs, which have clearer data on outcomes, are increasingly incorporating elements of alternative pathways into their programs to create programs that provide academic and non-academic instruction. A recent online survey of over 55,000 high school students revealed some interesting findings related to the enthusiasm and readiness for postsecondary education. 84 percent of students indicated a desire to go to college, with only five percent definitely saying no to college. 68 percent of students had plans to attend a 2- or 4-year college immediately after high school. Interestingly, only 50 percent of 12th grade students feel that their school has helped them develop the skills and knowledge they will need for college-level classes. Students are aware of the various support services offered, and they generally agree those services are helpful. However, not many students are actually choosing to take advantage of them. This could be for a number of reasons, but advertising these services and reducing the stigma of using them might help. The Education Commission of the States launched a 50-state scan highlighting how states issue and analyze postsecondary feedback reports. An interesting finding is that 39 states publicly report high school feedback reports with data on postsecondary enrollment and/or performance. A new report finds that English language learners are proportionally under-enrolled in New York City’s CTE programs, and that they are less likely to successfully complete the programs once enrolled. The report’s authors feel that this is a major opportunity to enroll more English language learners in CTE programs, as those who do complete their CTE programs graduate at a rate that is 30 percent higher than other English language learners in the city.